I have progressed from Milk Chocolate, to becoming a DARK Chocolate snob! Especially Dove Dark Chocolates. I love to just them sit in my mouth and melt away. Mmmmmmm! 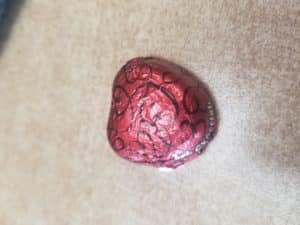 The other great thing is the message inside of the Dove Chocolates. Sometimes they’re inspiring. Sometimes they’re funny. 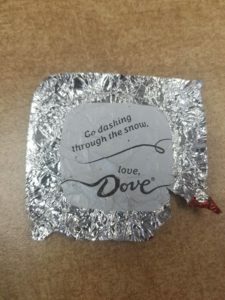 But this time, this message seemed like Dove Chocolates was shaming Michiganders. Take a look. “Go Dashing Through The Snow“. Hey Dove, us Michiganders have had enough of this snow!! And now you want us to go DASHING through it? How about we try this instead. We are DONE with Snow!